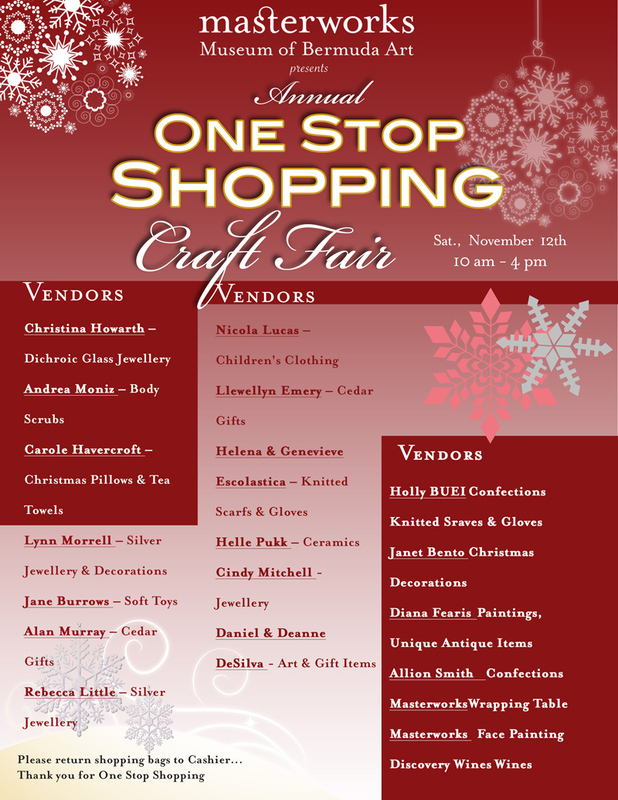 Masterworks is inviting the public to attend their annual One Stop Shopping Event on November 12 from 10.00am to 3.00pm. A spokesperson said, “Come on in and shop for one of a kind items from some of the top Craft Vendors on island. We will also be offering face painting, a fun photo booth complete with costumes, Christmas crafts in the classroom, and will be showing classic Christmas films to keep the little ones busy while Mom and Dad shop. The vendors attending include Christina Howarth – Dichroic Glass Jewellery; Andrea Moniz – Body Scrubs; Carole Havercroft – Christmas Pillows & Tea Towels; Lynn Morrell – Silver Jewellery & Decorations; Jane Burrows – Soft Toys; Alan Murray – Cedar Gifts; Rebecca Little – Silver Jewellery; Nicola Lucas – Children’s Clothing; Llewellyn Emery – Cedar Gifts; Helena & Genevieve Escolastica – Knitted Scarfs & Gloves; Helle Pukk – Ceramics; Cindy Mitchell – Jewellery; Daniel & Deanne DeSilva – Art & Gift Items; Holly BUEI – Confections Knitted Sraves & Gloves; Janet Bento – Christmas Decorations; Diana Fearis – Paintings, Unique Antique Items; Allion Smith – Confections; and more.